A Comma-separated values, or CSV, is the standard file for importing and exporting contacts. Gmail, Apple Mail, Outlook and all the other email software uses this format. Notepad on Windows or TextEdit on Mac handle these files. Lists in Excel files can be saved as a CSV. Imported subscribers are automatically "confirmed": they won't get an email asking them to confirm their subscription. Consider yourself a spammer if these people never asked to be on your list. Read more. 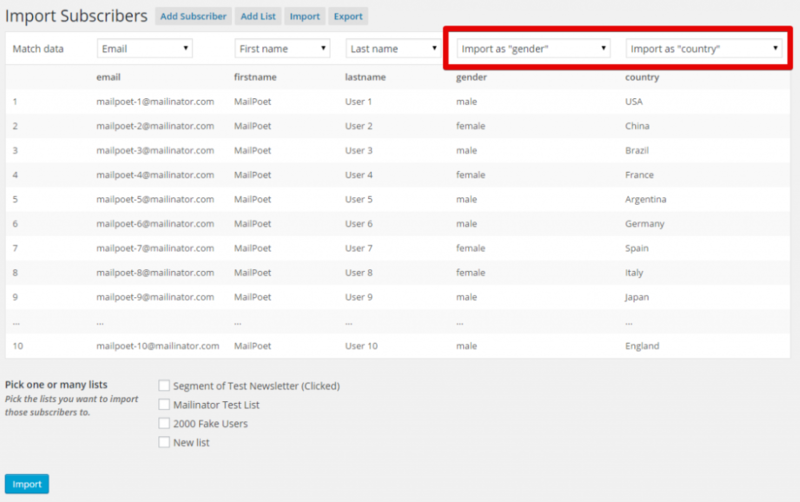 The first line with "Email" and "Name" shows the required column headers. Without those, MailPoet won't be able to import. Download an example CSV file with a dozen fake emails to see what it looks like. Importing an already existing email address will not duplicate it. Be aware that your existing subscribers' data will be overwritten. You might want to included your unsubscribed subscribers the first time you import. This is a good way to prevent you sending to previously unsubscribed folks with MailPoet. A few users have had this error just after importing. The solution is to change folder permissions to 777 for wp-content/uploads/wysija/import. If this sounds like nonsense to you, read this article on the WordPress codex. You will need FTP access to your site!